You are currently browsing the tag archive for the ‘whimsy’ tag. “You are about to see one of Carole Lombard’s best films: Mr and Mrs Smith. It’s the only comedy Hitchcock ever directed.” The angel took a long drink of soda. In the fading light, the angel turned slowly to Ling. For several moments his eyes became enormous, pinwheeling fire everywhere. Well it has been a heavy couple of days here on the blog. Weighty themes, arresting imagery…..teddy bears altered in strange and disturbing ways (seriously, James Ellroy, get help!). 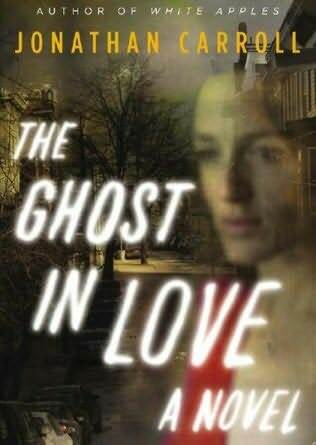 So for today I chose Jonathan Carroll’s The Ghost in Love. I am a big fan of his whimsical present-day fables and will mention some more about his writing later, but first off – the plot! Benjamin Gould is a young man in the prime of his life. He loves to cook, in fact his book shelves are filled with recipe books. His kitchen is his true home and he enjoys many different kinds of tea. He’s good with his hands and rather than sulking when things don’t go his way, he will often begin working on a new table, or chair. He’s also a young man who has already endured tragedy, sadness and loss – but he’s happy now, because he’s met the love of his life. The strangely named German Landis is a ray of sunshine, a beacon of warmth and kindness. She inspires him to be a better man, to leave the bitterness of his past behind. One day she suggests they adopt a dog from the pound, but not just any mutt. They should choose the dog that has languished there the longest. Ben enthusiastically agrees and rushes out. This is what life with German is like, spontaneity and good will as natural as breathing. Unfortunately for Ben, he dies on the way home. Even more unfortunately for Ben, German, even the dog, Pilot, and the angels in Heaven who run the whole life and death game….he doesn’t notice he has died. And from here, things begin to get strange. The Angel of Death assigns a ghost named Ling to follow Ben and discover why he has not passed on. Somewhere in his mind is the reason for his strange survival. Maybe somewhere buried deep in his past is the secret of immortality, making Ben very important indeed. Important enough to scare the Angel of Death himself near out of his wits. For if humans can suddenly learn how to master their own mortality, maybe that changes everything. Maybe in this upside-down world angels and ghosts have reason to fear humans! Jonathan Carroll has a gift for making the mundane seem magical. In a story about life and death, angels and monsters, he makes it seem so easy. This book was a breeze to read, a light confection that felt like an old Hollywood romance. Cinema is something of a passion for Carroll, as well as dogs, so I know he’s good people. It reminded me a little of Powell and Pressburger’s A Matter of Life and Death, where air force pilot David Niven refuses to die and accept his heavenly award, as he has just met the love of his life, played by Kim Hunter. In Carroll’s universe dogs and ghosts speak to one another amiably, the Angel of Death is obsessed with Carole Lombard movies and your past literally can catch up with you. Maybe even ball you out for not being more careful. The very first scene of the novel is just delightful. Ling, Ben’s ghostly ‘caseworker’, is fretting over a sumptuous feast for German, whom she has also fallen in love with. As Pilot the bemused dog and her only friend looks on, she prepares a breakfast smorgasbord of salmon, eggs Benedict, scones, soufflé, even fine coffee. The woman of her dreams arrives in the apartment, sits down at the table and is completely oblivious to the phantom feast laid out before her. It’s a beautifully sustained sequence. One of my favourite books is Carroll’s The Land of Laughs, his first published novel. It also deals with memory, loss and death. If you read it you may come away with a newfound interest for pit-bull terriers. Seriously the man loves dogs. Whenever I encounter a book of his on a shelf I snap it up. The Ghost in Love is a treat for anyone looking for a story filled with wonder and whimsy. Enjoy.